Evidence mounts of mass psychosis in Israel, which is the full flowering of Zionist supremacist & colonial ideology. Zionists used to boast they made the desert bloom in Palestine. But bloom with what? Racism & social hatred so profound the society is disintegrating & rotting from cultural dry rot? This sicko was photographed in a Jerusalem pub Wednesday morning. It’s unconfirmed that he is an Israeli army reservist. Most US combat veterans come home with psychosis, addiction, & other mental health problems; thousands commit suicide over guilt & grief at what they saw & did. 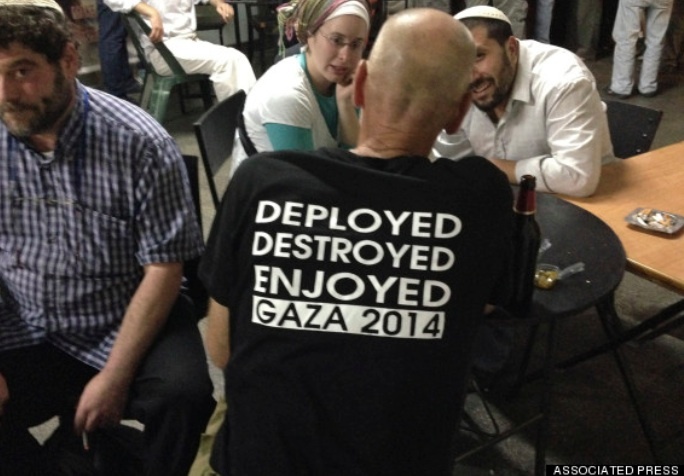 Juicing it up in the morning might mean this guy has a shred of humanity left but when you flaunt ethnic cleansing on your shirt & drown your sorrows in a pint while psycho politicians praise you for your crimes, chances are there isn’t much left–& what is left isn’t worth the bother. Keep marching for Palestine & evangelize for the economic boycott of all Israeli products (barcode beginning 729).